At the beginning of service, heard from Heith Reade, the leader of our Ministry Team. He shared how we all have an opportunity to link arms together and contribute to discipling people of the West Valley. Heith has been conducting a 5 week course on the power of prayer and will soon be putting together a discipleship course for new believers. If you would like more information or would like to join the Prayer Team, please send us a message and we’ll get you connected with Heith! This Sunday we got to hear from Pastor Sandy Brown. Pastor Sandy has such a “Mama Anointing” on her life and we are so blessed to all be under her care. Pastor Sandy shared about her faith background and her story of walking with Jesus. She shared testimonies of how God showed up and provided which provoked an increase of faith that Father God knows and cares about the details of our lives. We are all part of the Mission of Christ, no matter what sphere of influence we’re in. It’s not so much about gifting as much as it is about obedience and walking in faith! 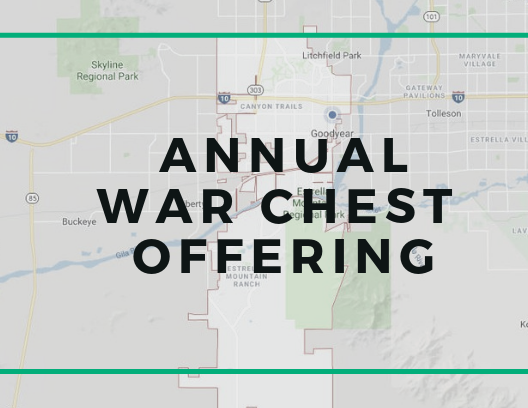 If you would like to contribute to our Annual War Chest Offering that will help with building repairs, maintenance, upgrades as well as creative ways to minister to the West Valley, our War Chest Offering is open until the end of April. You may set up a one-time offering or monthly recurring giving using our online giving platform, Tithe.ly. It is now easier than ever to set up a giving option that works best for you!